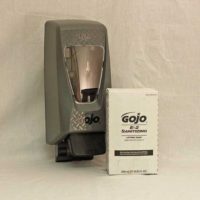 Ideal for locker rooms, tool cribs/rooms, clean-up sinks, and production and maintenance areas, this dispenser helps promote workplace health and sanitation. The diamond plate design offers a rugged, durable look, with a large sight window for at-a-glance monitoring. Portion control helps reduce waste.